No pilot light equals no hassle! Hayward has developed an induced draft heater for aboveground pools that combines state-of-the-art technology with ease of operation and superior performance. Featuring an intuitive electronic panel with digital thermostat and durable cupro-nickel heater exchanger, this Hayward heater provides 135,000 BTU input, while delivering 82% thermal efficiency and quick heating. Built with a durable cupro nickel heat exchanger as standard, H-Series 135,000 BTU heaters offer exceptional protection against corrosion and premature failure caused by unbalanced water chemistry, ensuring you get season after season of premium heating performance. 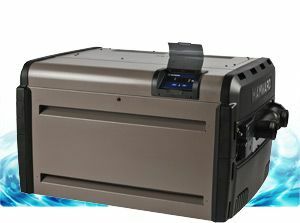 H-Series 135,000 BTU heaters boast industry-leading hydraulic performance coupled with faster speed-to-heat capability. Their intuitive electronic panel is also quick and easy to operate, so pool owners can spend less time messing with controls and more time relaxing in the water. Engineered with “totally managed” water flow, H-Series 135,000 BTU heaters save energy (and money) by reducing pump run time. Their low NOx emissions meet air quality standards in all low-NOx areas, so you can rest easy knowing their environmental impact is low. Gas Connection at Heater ¾"
Footprint Depth (inches) 27 5/8"
Heater Weight (lbs) 100 lbs. Plug-in 120 Volt electric cord included for easy installation. Must be plugged into GFCI rated for 15 amps. Patented single header ‘V’ Baffle design heat exchangers allow for long life, fast heating and virtually no condensation. 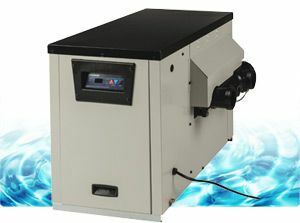 This heater is only available in 150,000 BTU or 250,000 BTU which are ideal for pools with a surface area of 450 sq. ft and 750 sq. ft respectively. Universal H-Series Low NOx heaters have an industry-leading thermal efficiency making them a perfect choice for the environmentally concerned pool owner. The H-Series ignition system delivers dependable lighting and reliable operations with just a touch of a button. The forced draft system constantly moves air through the combustion chamber to eliminate all outside weather variables affecting heating performance, such as wind conditions and eliminates the need to install a high wind stack. 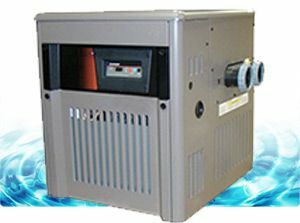 H-Series heaters are sized according to the surface area of the pool. 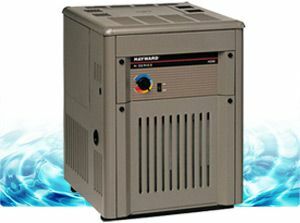 A pool heater should heat the pool, on average, one degree an hour. Once the heater is sized to the pool, stepping up one or two sizes will decrease the time to heat. Note*- If you are replacing an existing heater, the new heater size is limited by the diameter of the existing gas supply pipe. Gas pipe is sized according to BTU’s required. Installing a larger heater than the existing pipe can supply will result in a sporadic or non-operating heater. Consult a licensed gas technician to assess your situation. Although designed for budget- conscious applications, Hayward H-Series Millivolt heaters deliver uncompromising performance and economy. A standing pilot ignition system ensures reliable lighting, and- like all H-Series Heaters- they feature a Cupro Nickel heat exchanger and Fire Tile combustion chamber. 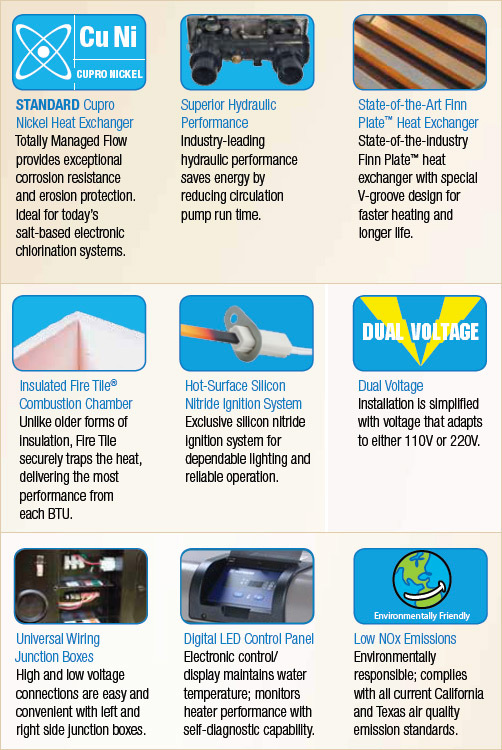 **See Sizing Guide for selecting the correct size heater for your pool.